My girls have long been in need of a major closet makeover. 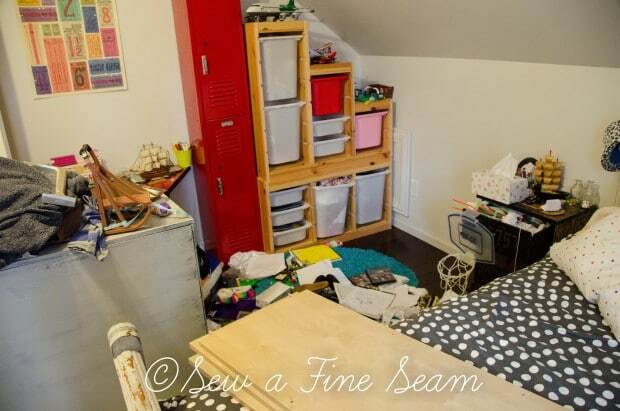 Whenever they ‘cleaned’ their room most of their stuff could be found by opening the closet doors. Everything that wasn’t stuffed under the bed that is. I had an idea what I wanted. Shelves of some sort along the back wall and a closet rod running along the short end instead of along the front like a normal closet. 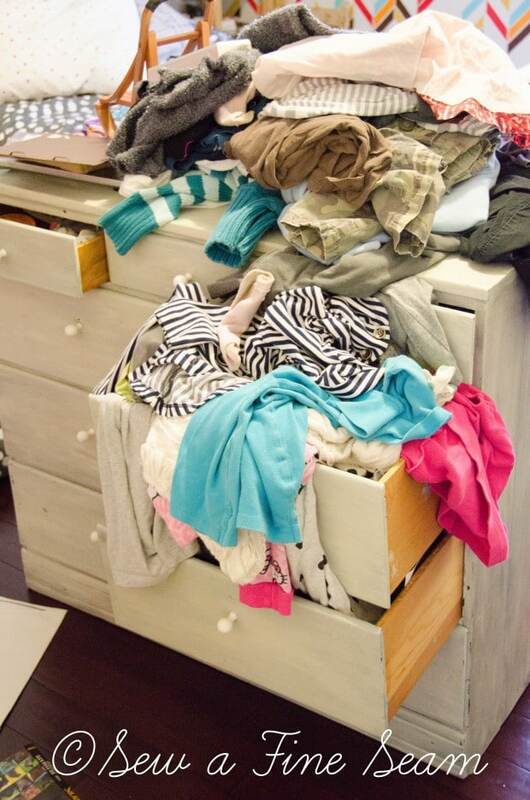 I was tired of their dresser (which was in the back of the closet) looking like this. It was way too small for 2 girls, especially when you have winter and summer things in the same space. And the rest of the room and closet looking like this. 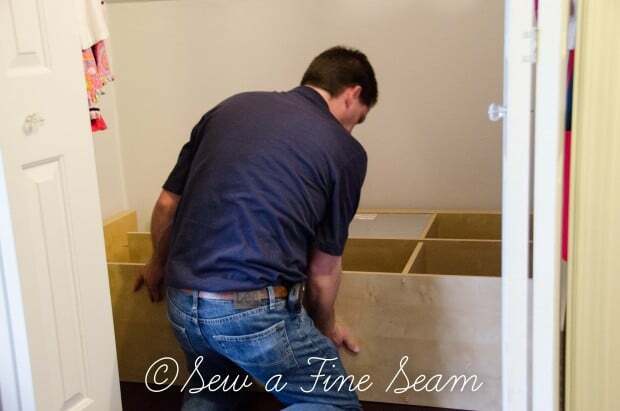 You can see the bottom of the side piece in this photo – because the ends of the pieces were thick wood Travis was able to just cut the side pieces down one shelf to create a unit that would fit with our short wall space in our upstairs. Travis was going to build shelves. You know, in his spare time. But I always come up with other projects and odd jobs to fill his spare time if he ever has any. So I was considering just buying some sort of shelving at a home improvement store. On the way home we stopped at IKEA. The route to Cincinnati takes us right by IKEA. NOT stopping is just not an option. My hubby loves IKEA about as much as I do so it’s really not even discussed – it’s just a fact that we WILL stop at IKEA. In the AS-IS section, where everything is marked way down, there were several sets of wood wall cubbies. There was an all-white set that was only $105. I really wanted it and thought it would be cool in the girls closet. It would need to be shortened a bit to fit but all it needed was cut down, put together and shoved in the closet. No cutting, building, figuring, measuring, re-measuring, sanding, painting, and whatever else goes into building your own set. Travis thought it a good idea too but by this point he was done. I was buying the place out of their pillow forms and had added a few other things to the carts (yes, we had to have 2 carts to hold all my pillow forms and they were piled high) All he could see at this point was dollar signs – and a car full of feathers 😀 And he wasn’t in the mood to figure out if we could get it all in the car. Now I must insert here that I knew we could get that set of shelf cubbies in the car. All of IKEAs stuff is built to be compact to haul. They just needed taken apart and they would go in first and then all the other stuff we had could go on top. It was very do-able. I’ve packed that car full so many times I DO know what I’m doing. But I held my tongue – well I DID tell him that stuff in the AS-IS section moves quickly – but I could tell it wasn’t worth pushing it so we, and our mountain of pillows, checked out and headed home. Next Morning: First words out of Travis’ mouth were something about those shelf cubbies. He couldn’t get it out of his head how much time and money that would have saved him to just buy them. And after a good nights sleep he was more in the mood to think about it too. In the end he headed back to IKEA to get them. He called when he got there. Want to know what he said?! ‘You weren’t kidding when you said this stuff moved fast’!!! Snicker snicker. Don’t you love it when they admit you were right?! So the white one was gone but there was a natural wood and a black one. I told him to get the natural one and to get it on a cart fast! He got it, brought it home, hauled it in, cut it down, put it together and had it all installed that night. He hung the new closet rod and viola! Closet makeover complete. And it has helped a lot. We went through all their clothes and made some discard piles. One to put in the garage sale this fall, one for goodwill, and a few things to give to our friends down the street. The girls are thrilled with it and they love the doors on this one. The white one didn’t have the doors. This one cost a bit more – around $130 I think, but totally worth it. And it only took one day to get it all in place. Win-win! Now if I can just get their fabric-covered bulletin board hung and a piece of artwork made we will have all the projects we planned for this room complete! That is so cool that your husband likes to go to Ikea with you. My husband has never set foot in one and probably never will. My teenage son likes to go with me though….but it is because he likes their food! 🙂 The cubbies look great in the closet! I raved about IKEA the times I went before my hubby had ever gone. He was a bit skeptical but once he’d been there he loved it too. The prices are great and so far anything we’ve bought there he’s been very impressed with the way it was built and how easy it is to put together. Smart woman to hold your tongue!!! 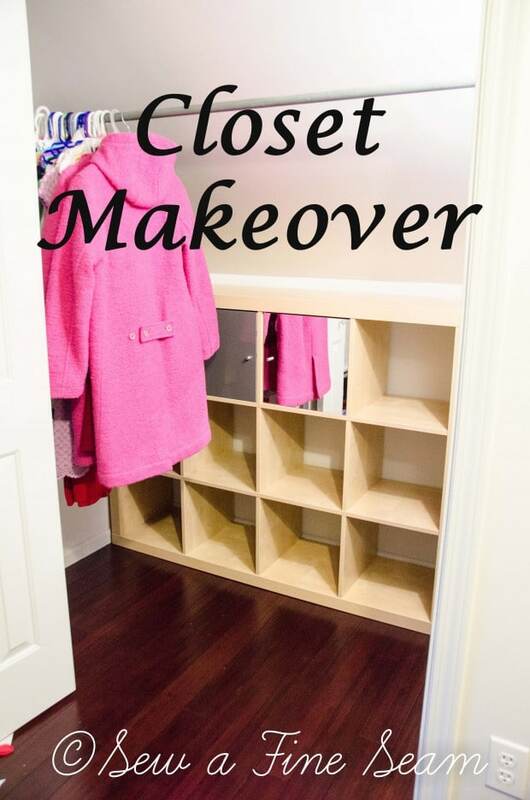 Great job on the closet – I need to do something like this myself!!! But my kids are all gone and I need to make their old closets more user friendly for me!!! Thanks Susan! I know my girls will all be out on their own before I know it too! It looks great! I love the rod to the side. It looks so much handier to get to. I despise trying to get to something and I’m banging my head or leaning sideways. I love the girl-in-the-shelves. Those shelves look super! And I love that I feel like being online again. We love these shelves. They have room for all their stuff now and even took all the stuff out of the bathroom that we kept in there cause they didn’t have room for it upstairs. They have much more play room now in hte closet if they want to use it for that too. Great makeover–and even more so because it is simple! We live in a 60-year old ranch-style home, which we plan to put on the market soon. 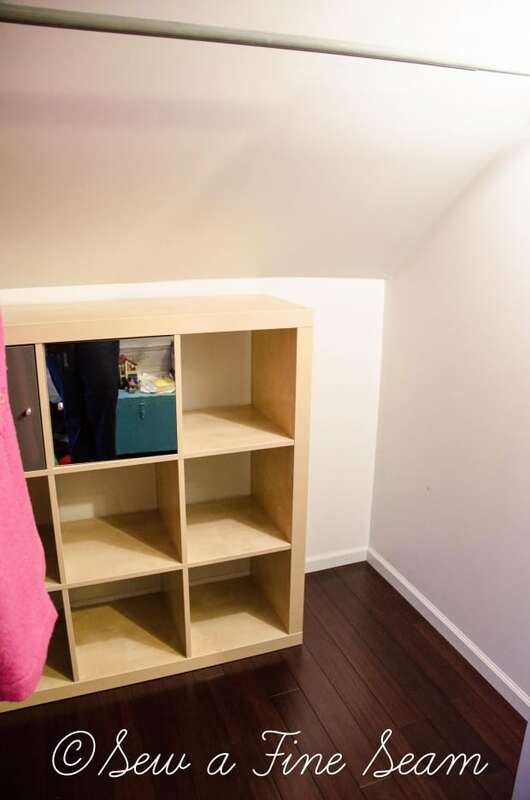 It is a pretty, livable house, but closet space is a BIG drawback. 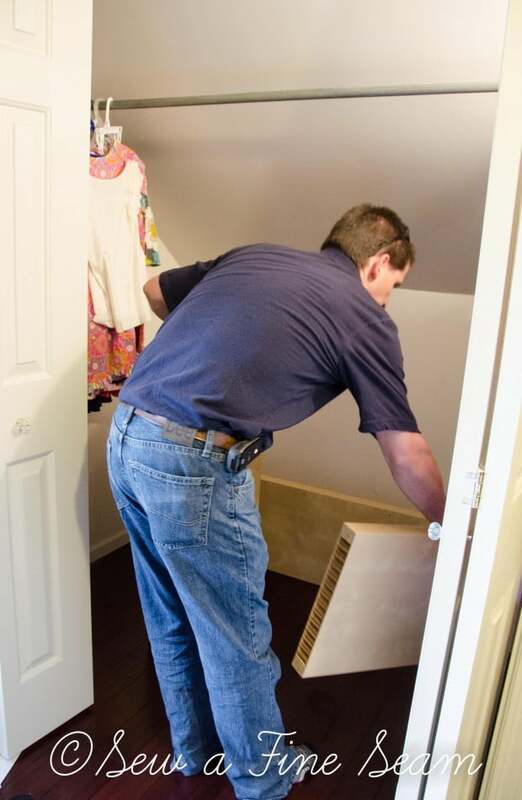 They just didn’t build big closets in the 50’s, and we have done away with several of the ones we DID have while we were re-arranging walls, etc. Your project inspires me to tear into ours and make them more user-friendly. Thanks so much! Our house didn’t really have any closets when we moved in. We’ve added them to all the bedrooms. 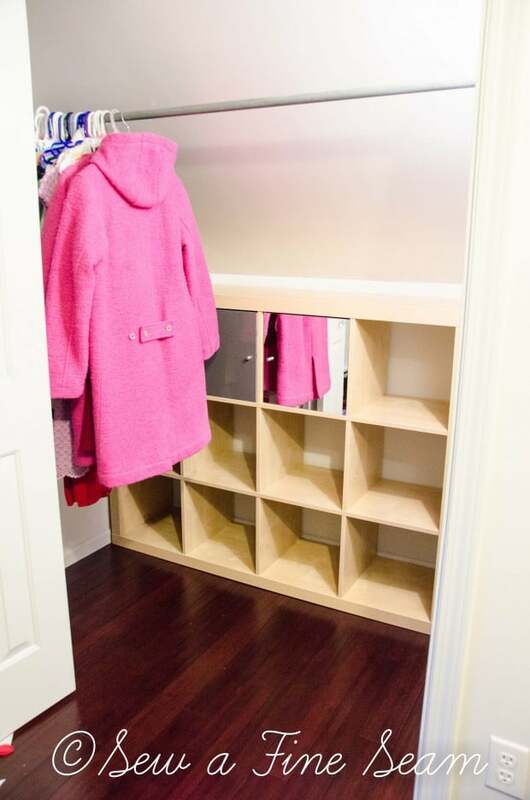 Makes for smaller rooms when you take the space for closets but closets are a must in my book! Good for you Carla! Hope it comes together really well for you! I wish my hubby loved going to IKEA with me..but he does NOT lol. This is a great project Jill! Makes life and organizing so much nicer. I wish too your hubby liked going with you! It is really nice cause I don’t have to beg or then feel like I have to rush cause he’s all bored! I do the same thing with the pillow forms when I go to IKEA…I usually buy at least a dozen! Glad it all worked out and the closet got finished. Whew! I cleaned them out of the 16×26 size – and still didn’t get as many as I needed in that size. And I bought a ton of the 20×20 size too. I bought 42 forms altogether I think! I was buying them for a friend too so I needed a lot! THat must be such a relief to have their closet done. Congrats to you for tackling a hard job. Looks like there’s much more room in their closet now. 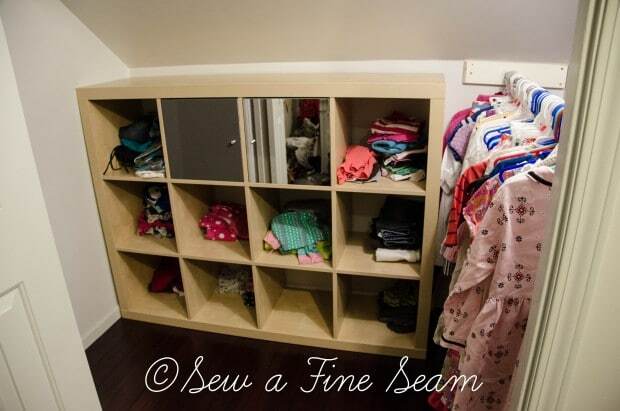 If you have older home closets weren’t built big as people didn’t have many clothes. Our walk in closet is a joke. Hopefully seeing you do the girls closet will inspire me to do ours. 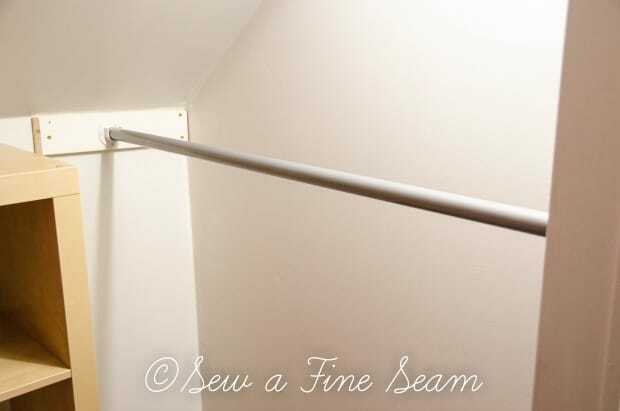 Then there’s the sewing room closet, EEEEKKKKKK. Cubbies are great, we have one in our bathroom for all our towels, toiletries. Need to have hubs build a base for it with casters so when I’m cleaning can move it to clean under. Our house gets so dusty dirty all the time, no matter how often or well I clean. You are so lucky to have an IKEA fairly close to you. Think closest one to us is Denver, forget it. They had a great metal table I wanted couple years ago but they don’t ship it. Ah well. Haven’t been on their web site for long time, why bother, just makes me want things can’t have. Hubs is mad enuf cause I bought that couch instead of giving him the money for new roof. Guess $100 was really gonna pay for it. He keeps harping at me to stop buying things at thrift store, like my books, so we can have new roof but then he’ll want to go out to eat,talk about dbl standards. And you were smart not to say anything, have to pick our fights when we really need to, lol. Have fun this week, go someplace, maybe all of you when hubs comes home. Summer goes too fast and it’s for sure life does. 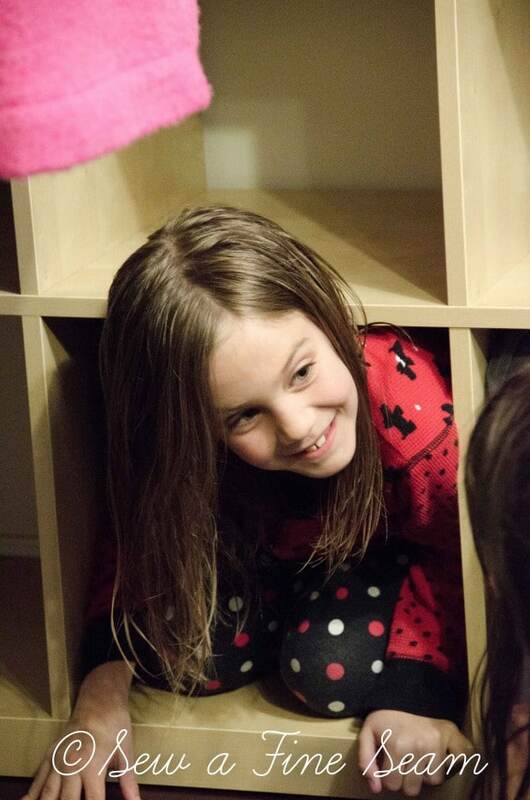 We are all loving the cubbies – so glad we got them from IKEA instead of making them. We would have spent more on wood to build them than we did on this set! You could buy the doors separate,sets of 2 drawers, plastic bins and fabric bins. 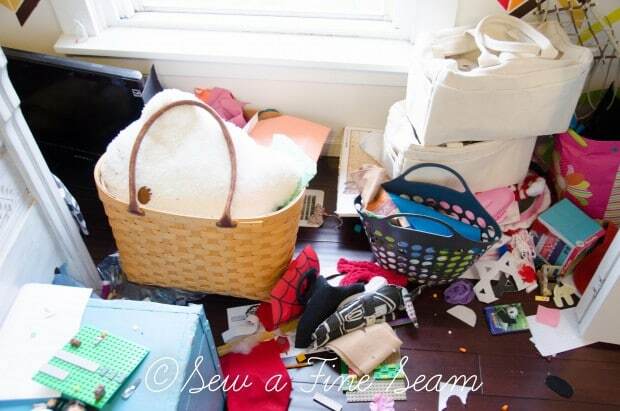 I have a set of 5 X 5 in my sewing/craft room and 10 of the fabric bins. My shelves are at least 12 years old, only made the leap to the bins last year. Not sure why I waited all that time. They are wonderful!! I am not sure what they have now, they keep changing the accessories that are available. The bin colors change regularly. After I had them in there my closet was next on my list and I bought 8 for in there and 10 smaller ones somewhere else that cost me as much as the large Ikea ones (the large ones were to high.) They are the best investment for keeping my closet in order. So nice to walk in and be able to pull out a bin and find just what I was looking for. I attached chalk painted labels to the front of mine with mini clothes pins.